Why Is the US Military So Interested in Chad? The US military continues a long series of mistakes, missteps and mishaps across Africa. That the United States is doing more in Chad specifically isn’t particularly astonishing either. Earlier this year, TomDispatch and The Washington Post both reported on separate recent deployments of US troops to that north-central African nation. Nor is it shocking that the new American compound is to be located near the capital, N’Djamena. The United States has previously employed N’Djamena as a hub for its air operations. What’s striking is the terminology used in the official documents. After years of adamant claims that the US military has just one lonely base in all of Africa—Camp Lemonnier in the tiny Horn of Africa nation of Djibouti—Army documents state that it will now have “base camp facilities” in Chad. Nonetheless, one fact is crystal clear: the United States is ever more tied to Chad. This remains true despite a decade-long effort to train its military forces only to see them bolt from one mission in the face of casualties, leave another in a huff after gunning down unarmed civilians, and engage in human rights abuses at home with utter impunity. All of this suggests yet another potential source of blowback from America’s efforts in Africa which have backfired, gone bust, and sown strife from Libya to South Sudan, the Gulf Guinea to Mali and beyond. Following 9/11, the United States launched a counterterrorism program, known as the Pan-Sahel Initiative, to bolster the militaries of Mali, Niger, Mauritania and Chad. Three years later, in 2005, the program expanded to include Nigeria, Senegal, Morocco, Algeria and Tunisia and was renamed the Trans-Sahara Counterterrorism Partnership (TSCTP). The idea was to turn a huge swath of Africa into a terror-resistant bulwark of stability. Twelve years and hundreds of millions of dollars later, the region is anything but stable, which means that it fits perfectly, like a missing puzzle piece, with the rest of the under-the-radar US “pivot” to that continent. Coups by the US-backed militaries of Mauritania in 2005 and again in 2008, Niger in 2010 and Mali in 2012, as well as a 2011 revolution that overthrew Tunisia’s US-backed government (after the US-supported army stood aside); the establishment of Al Qaeda in the Islamic Maghreb in 2006; and the rise of Boko Haram from an obscure radical sect to a raging insurgent movement in northern Nigeria are only some of the most notable recent failures in TSCTP nations. Chad came close to making the list, too, but attempted military coups in 2006 and 2013 were thwarted, and in 2008, the government, which had itself come to power in a 1990 coup, managed to hold off against a rebel assault on the capital. Through it all, the United States has continued to mentor Chad’s military, and in return, that nation has lent its muscle to support Washington’s interests in the region. Chad, for instance, joined the 2013 US-backed French military intervention to retake Mali after Islamists began routing the forces of the American-trained officer who had launched a coup that overthrew that country’s democratically elected government. According to military briefing slides obtained by TomDispatch, an Intelligence, Surveillance and Reconnaissance (ISR) liaison team was deployed to Chad to aid operations in Mali and the United States also conducted pre-deployment training for its Chadian proxies. After initial success, the French effort became bogged down and has now become a seemingly interminable, smoldering counterinsurgency campaign. Chad, for its part, quickly withdrew its forces from the fight after sustaining modest casualties. “Chad’s army has no ability to face the kind of guerrilla fighting that is emerging in northern Mali. Our soldiers are going to return to Chad,” said that country’s president, Idriss Deby. In September of 2013, the US military organized meetings with Chad’s senior-most military leaders, including Army chief General Brahim Seid Mahamat, Minister of Defense General Bénaïndo Tatola and counterterror tsar Brigadier General Abderaman Youssouf Merry, to build solid relationships and support efforts at “countering violent extremist operations objectives and theater security cooperation programs.” This comes from a separate set of documents concerning “IO,” or Information Operations, obtained from the military through the Freedom of Information Act. French officials also attended these meetings, and the agenda included the former colonial power’s support of “security cooperation with Chad in the areas of basic and officer training and staff procedures,” as well as “French support [for] US security cooperation efforts with the Chadian military.” Official briefing slides also mention ongoing “train and equip” activities with Chadian troops. In all, thirty civilians were reportedly killed and more than 300 were wounded. Amid criticism, Chad angrily announced it was withdrawing its troops. “Despite the sacrifices we have made, Chad and Chadians have been targeted in a gratuitous and malicious campaign that blamed them for all the suffering” in the Central African Republic, declared Chad’s foreign ministry. In July, AFRICOM admitted that it had reduced surveillance flights searching for the girls to focus on other missions. Now AFRICOM tells TomDispatch that, while “the United States continues to help Nigeria address the threat posed by Boko Haram, the previously announced ISR support deployment to Chad has departed.” Yet more than seven months after their abduction, the girls still have not been located, let alone rescued. In June, according to the State Department, the deputy commander of US Army Africa (USARAF), Brigadier General Kenneth H. Moore Jr., visited Chad to “celebrat[e] the successful conclusion of a partnership between USARAF and the Chadian Armed Forces.” Secretary of the Navy Ray Mabus arrived in that landlocked country at the same time to meet with “top Chadian officials.” His visit, according to an embassy press release, “underscore[d] the importance of bilateral relations between the two countries, as well as military cooperation.” And that cooperation has been ample. Earlier this year, Chadian troops joined those of the United States, Burkina Faso, Canada, France, Mauritania, the Netherlands, Nigeria, Senegal, the United Kingdom and host nation Niger for three weeks of military drills as part of Flintlock 2014, an annual Special Ops counterterrorism exercise for TSCTP nations. At about the time Flintlock was concluding, soldiers from Chad, Cameroon, Burundi, Gabon, Nigeria, the Republic of Congo, the Netherlands and the United States took part in another annual training exercise, Central Accord 2014. The Army also sent medical personnel to mentor Chadian counterparts in “tactical combat casualty care,” while Marines and Navy personnel traveled to Chad to train that country’s militarized anti-poaching park rangers in small-unit tactics and patrolling. As for US Army Africa, it sent trainers as part of a separate effort to provide Chadian troops with instruction on patrolling and fixed-site defense as well as live-fire training. “We are ready to begin training in Chad for about 1,300 soldiers—an 850 man battalion, plus another 450 man battalion,” said Colonel John Ruffing, the Security Cooperation director of US Army Africa, noting that the United States was working in tandem with a French private security firm. In the months since the Chadian armed forces’ massacre in Bangui, various US military contract solicitations and related documents have pointed toward an even more substantive American presence in Chad. In late September, the Army put out a call for bids to sustain American personnel for six months at those “base camp facilities” located near N’Djamena. Supporting documents specifically mention thirty-five US personnel and detail the services necessary to run an austere outpost: field sanitation, bulk water supply, sewage services and trash removal. The materials indicate that “local security policy and procedures” are to be provided by the Chadian armed forces and allude to the use of more than one location, saying “none of the sites in Chad are considered U.S.-federally controlled facilities.” The documents state that such support for those facilities is to run until July 2015. Benson would not, however, let me speak with an expert on US military activities in Chad. Nor would he confirm or deny the continued presence of the Intelligence, Surveillance and Reconnaissance liaison team deployed to Chad in 2013 to support the French mission in Mali, first reported on byTomDispatch this March. “[W]e cannot discuss ISR activities or the locations and durations of operational deployments,” he wrote. If an ISR team is still present in Chad, this would represent a substantive long-term deployment despite the lack of a formal US base. The N’Djamena “base camp” is just one of a series of Chadian projects mentioned in recent contracting documents. An Army solicitation from September sought “building materials for use in Chad,” while supporting documents specifically mention an “operations center/multi-use facility.” That same month, the Army awarded a contract for the transport of equipment from Niamey, Niger, the home of another of the growing network of US outposts in Africa, to N’Djamena. The Army also began seeking out contractors capable of supplying close to 600 bunk beds that could support an American-sized weight of 200 to 225 pounds for a facility “in and around the N’Djamena region.” And just last month, the military put out a call for a contractor to supply construction equipment—a bulldozer, dump truck, excavator and the like—for a project in, you guessed it, N’Djamena. 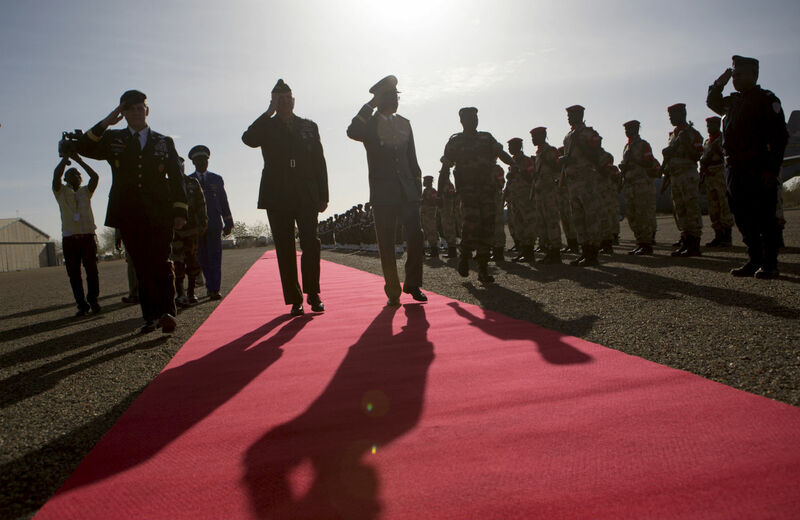 This increased US interest in Chad follows on the heels of a push by France, the nation’s former colonial overlord and America’s current premier proxy in Africa, to beef up its military footprint on the continent. In July, following US-backed French military interventions in Mali and the Central African Republic, French President François Hollande announced a new mission, Operation Barkhane (a term for a crescent-shaped sand dune found in the Sahara). Its purpose: a long-term counterterrorism operation involving 3,000 French troops deployed to a special forces outpost in Burkina Faso and forward operating bases in Mali, Niger and, not surprisingly, Chad. “There are plenty of threats in all directions,” Hollande told French soldiers in Chad, citing militants in Mali and Libya as well as Boko Haram in Nigeria. “Rather than having large bases that are difficult to manage in moments of crisis, we prefer installations that can be used quickly and efficiently.” Shortly afterward, President Obama approved millions in emergency military aid for French operations in Mali, Niger and Chad, while the United Kingdom, another former colonial power in the region, dispatched combat aircraft to the French base in N’Djamena to contribute to the battle against Boko Haram. In recent years, the US military has been involved in a continual process of expanding its presence in Africa. Out of public earshot, officials have talked about setting up a string of small bases across the northern tier of the continent. Indeed, over the last years, US staging areas, mini-bases and outposts have popped up in the contiguous nations of Senegal, Mali, Burkina Faso, Niger and, skipping Chad, in the Central African Republic, followed by South Sudan, Uganda, Kenya, Ethiopia and Djibouti. A staunch American ally with a frequent and perhaps enduring American troop presence, Chad seems like the natural spot for still another military compound—the only missing link in a long chain of countries stretching from west to east, from one edge of the continent to the other—even if AFRICOM continues to insist that there’s no American “base” in the works. Even without a base, the United States has for more than a decade poured copious amounts of money, time and effort into making Chad a stable regional counterterrorism partner, sending troops there, training and equipping its army, counseling its military leaders, providing tens of millions of dollars in aid, funding its military expeditions, supplying its army with equipment ranging from tents to trucks, donating additional equipment for its domestic security forces, providing a surveillance and security system for its border security agents and looking the other way when its military employed child soldiers. With Chad, the United States finds itself more deeply involved with yet another authoritarian government and another atrocity-prone proxy force. In this, it continues a long series of mistakes, missteps and mishaps across Africa. These include an intervention in Libya that transformed the country from an autocracy into a near-failed state, training efforts that produced coup leaders in Mali and Burkina Faso, American nation-building that led to a failed state in South Sudan, anti-piracy measures that flopped in the Gulf of Guinea, the many fiascos of the Trans-Sahara Counterterrorism Partnership, the training of an elite Congolese unit that committed mass rapes and other atrocities, problem-plagued humanitarian efforts in Djibouti and Ethiopia, and the steady rise of terror groups in US-backed countries like Nigeria and Tunisia.